The 43 English and Welsh police forces are the most expensive in the world and are in need of dramatic change, the think tank Reform has said. It says they are run as inefficient and costly fiefdoms accountable only to weak police authorities. And three years after plans for merged "superforces" were dropped, it suggests there should be more, smaller forces. The Home Office said it made no apology for record investments which had helped cut crime by over a third in 12 years. The Reform report said that if the forces do not change their structures, they risked losing the battle against rapidly changing crime. It said Scotland Yard should co-ordinate the national fight against serious and organised crime in the same way as it dealt with terrorism. Many regional forces should be split into smaller units, creating up to 52 more constabularies, because they are too big to be effective, the report added. This suggestion comes just three years after the government abandoned plans to merge many of the existing forces to create just 17 large "superforces". Reform's deputy director, Elizabeth Truss, said: "The threat of crime is changing and growing but the police response has been hampered by the obsolete structure of 43 regional forces. "England and Wales need a national lead force on serious crime such as gun crime, drugs and people trafficking. "The Serious Organised Crime Agency (Soca) is the wrong answer to the right question. The Metropolitan Police is the de facto national force and needs to be formally responsible. "Data shows small police forces catch more criminals than larger ones. The current 43 forces should be split into a total of around 95 so police forces can properly reflect their local communities." The report, called A New Force, said the cost of policing had increased by more than £4.5bn since Labour came to power in 1997. The Association of Chief Police Officers (Acpo) was a "self-perpetuating oligarchy" of senior police officers, it added. A Home Office spokesman said: "The 60% increase in funding since 1997/8 combined with historically high numbers of police officers, staff and police community support officers has helped deliver very real benefits. "Crime has fallen by over a third in the last 12 years and the risk of being a victim of crime is historically low. "We are building on these successes by slashing red tape to get more officers on the beat, scrapping all top down targets except one - to increase public confidence, and making sure the police answer to the public, not government." 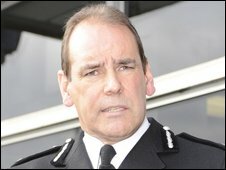 Sir Norman Bettison, representing Acpo, said the report was based on opinion rather than evidence but did highlight some key issues. Sir Norman, who is the chief constable of West Yorkshire, said: "Serious organised crime is not an abstract phenomenon. The drugs are dealt, firearms used and acquisitive crime committed in local neighbourhoods. "The perpetrators and their violence plague local communities. "There is therefore a benefit to a single structure, able to build intelligence and the means to tackle criminality at neighbourhood, force, regional and national level."